Shopping for Dr. Horribles Sing-Along Blog T-Shirts? "With my freeze ray, I will stop the world." Make time stand still with this Dr. Horrible's Sing-Along Blog Freeze Ray T-Shirt! The front of the shirt says "Wonderflonium Powered" and "Stops Time. Tell your friends!" The weapon is surrounded by sparkly stars and, like Dr. Horrible, looks sensitive yet menacing. 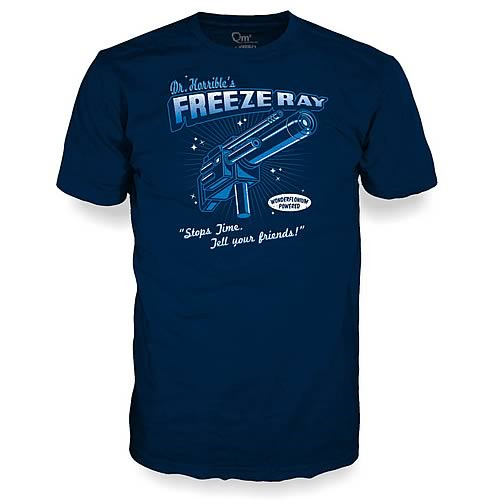 The Freeze Ray T-Shirt is a preshrunk, 100% cotton, navy Gildan shirt. Available in men's sizes small to 3XL and women's junior sizes small to 2XL.